I’ve been working on this shirt for M for 2 weeks, there’s little time after work since it’s an hour commute home and traffic has been hideous lately. I measured M and determined he was a large but he insisted he was an XL so that’s the pattern size I purchased. Everything had been smooth sailing, creating the pocket on the bias for a little interest and putting on the collar wasn’t too tricky. Attaching the arms gave me a bit of grief since they wanted you to fit an extra inch of fabric into the arm hole – what man wants puffy sleeves on a shirt??? 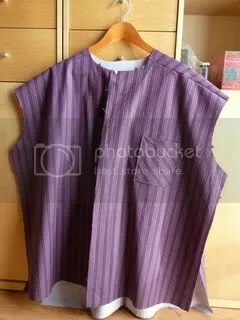 I tried twice to fit them in but I kept getting pleats and puckering so I decided to put an intentional pleat at the top of each shoulder at the seam as I’d seen on other shirts. Sewed up the sides and I could see the end of the tunnel. “Here Hon, try this on!” I said excitedly.